Wow, I can't believe how long it's been so I posted. The big, big news is that I've gone back to work full time. It was completely unexpected...I wasn't planning on going back to work until at least September but a friend called about an opportunity that was just too good to pass up. I'm not going to talk about the company but it's a start up in a technology based company. I am the Executive Assistant to the CEO (who is an awesome guy) and the EVP of Marketing (who is another awesome guy!). These two incredible men definitely swayed my decision to go back to work full time and after only two weeks have made it worthwhile! If you get a chance, check out our company website at http://www.atrato-inc.com/. Exciting company!!! So, that's part of my delay in blogging. Here's a current pic of the big girl. She's about 50 pounds now and is in a really mischievous stage. Some of her antics include: swallowing and throwing up a sock she found in the park (gross! ); dragging toilet paper around the house (now she can even swing the bathroom door open if there's a crack); mangling my cheap, but cute reading glasses; swallowing a pair of my undies which luckily I was able to pull out of her throat; dragging various pieces of clothing out into the backyard where she either tries to bury it or swallow it. But when she lies down in bed at night and when she wakes up in the morning feeling all snuggly, it makes it all worth it. She also just got spayed and had her tummy tacked to prevent stomach twisting during bloat so she's on "low level" activity. Have you ever tried to keep a 5 month puppy on low leve activity? Impossible!!!! I don't know what was in the birdbath but she was very interested!!! More big news, May 28, we're hoping that Angus' puppies will be born. The mom's pregnancy is confirmed, we just have to wait and see if there are any boys. Whew, at least that gives me three more months of working with Kimi before bringing another pup in the house!!! Cut my hair again...hated the thick bangs and even from the beginning, I felt like it was too long. This isn't a great pic but you get the idea. This is the day I got it cut and I actually style it a little differently. I'm getting it trimmed before Italy and may even go a tad shorter!!! Looking for some more fun blog stuff??? You should check out Robin at my favorite blog!!! She's doing some really fun stuff over there....and I know that all of you who read my blog are travel fans and should go over there and participate in her Travel Tip Tuesdays or Travel Photo Fridays!!!! And last but not least, Italy is only 20 days away!!!! I can't wait...not that I need a vacation...I just can't wait to be in Italy again. Here's a little Rome treat for you!! 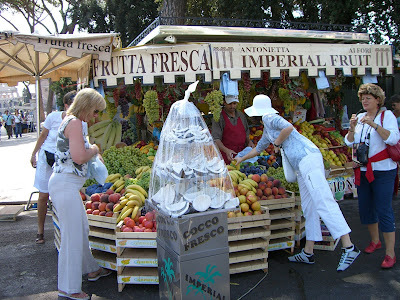 I loved these Frutta Fresca (fresh fruit) stands. That's coconut under the plastic....fresh coconut...and they are being misted to keep them cool & fresh?? I didn't have any, but we saw them all over Italy...doesn't it just scream summer ?? There's not much going on around our hood these days. I am glad to be home from North Carolina. I have loved working markets with Sally, but they are exhausting weeks and I can hardly keep up. I needed a whole weekend just to catch up on my sleep. We are having beautiful weather today in Colorado...80 degrees!!! Kimi is growing like a weed. She and I went to a dog show in Brighton on Sunday to see Angus...the papa of our new puppy....well, there isn't a confirmed doggy pregnancy yet but we are hopeful. 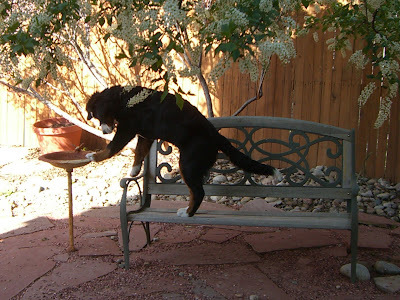 Angus is a beautiful Berner boy and we are hoping to get Kimi a brother this summer. Keep your fingers crossed!! This is him at the show on Sunday...he is a big boy!!! Here's an updated shot of our little girl, playing with her best neighborhood friend, Tia. It won't be much longer that she'll be able to fit under that stool!!! 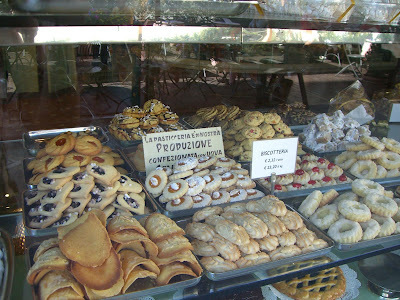 And last, but definitely not least, a teaser from our previous Italy trip. We are very excited and May 23 can't come soon enough!!! Aren't these yummy looking treats??? I'm always amazed at how beautiful the food in both Italy and France look. I'm not much of a "foodie" but I adore looking at beautiful food. Just a fun pic we took on the way into the showroom this morning. This building cracks me up every time we drive by!!! Sorry but no pics today. Just a quick update to the blog. I have a new look so let me know how you like it. We finally got to ski this weekend...how exciting!!! We spent the weekend up at Vail with our friends Dan & Tina and their awesome kids, Rachel & Trevor. We had a great time. On Saturday, we did a little shopping and a little sipping...I had a fun, tasty drink at Sweet Basil called "A Polar Bear Carrying a Mango Wearing Rollerblades"...it was a martini like cocktail made with rum, mango and some lime...that's all I remember. I just ordered it because I liked the name...tee hee. And it was tasty but a little sweet for my palate so I switched to a nice, crisp Sauvignon Blanc. Sunday it was a warm day up on the mountain and we had a couple of inches of fresh snow so we couldn't have asked for better skiing. I'm so disappointed to say that this was our only day of skiing this year...pitiful!!! We have lots of things going on right now. We are looking at getting Kimi a brother this summer. We're hoping our breeder will have news of a litter soon! I'm leaving for High Point, NC to work with Sally at the furniture market next week. It's always a fun, but exhausting week. Lots of other fun stuff going on but you'll have to wait for another post for that!!! Hope everyone is having a great April Fool's Day!! !